A graduate of Thomas Aquinas College (B.A. in Liberal Arts) and The Catholic University of America (M.A. and Ph.D. in Philosophy), Dr. Peter Kwasniewski is currently Professor at Wyoming Catholic College. He is also a published and performed composer, especially of sacred music. Now let us consider calmly what is being said here. Newman is praising Dunstan not just for the quality of his sacred music, but rather, for his use of the art of music simply speaking. The saint “use[d] music and painting as directly expressive or suggestive of devotion.” I believe there is a quite striking claim in this sentence: that the fine arts, of their very nature, are capable of expressing or suggesting to the soul the right attitude or relationship it should have with God. Naturally, this also means that they are capable of doing the opposite; and it is not at all clear to me that they are capable of being neutral, neither favoring nor hindering devotion. Moreover, his biographer tells us that Dunstan used his skill in musical instruments―here, again, we are not in the world of unaccompanied plainchant for Mass or the Divine Office, but rather, looking to the effect of instruments played recreationally―to do two things, one negative and one positive. First, by his music he would “charm away from himself and others their secular annoyances.” Let us be terribly honest with ourselves. Is not much of our life in the world an annoyance to the spirit? We are constantly fighting the world, the flesh, the devil; it is hard going, an uphill battle, a steep climb, an unremitting campaign. Our path to heaven is strewn with obstacles, beginning with our own sins, and the temptations thrown at us to indulge in them. From time to time, we need the refreshment of losing ourselves in something peaceful and pacifying, beautiful and beautifying―something that exists for its own sake, just because it is good, like God. The world will always be with us while yet we draw breath; but its annoyances can be chased away for a blessed moment by the power of music. That is not all; the best is yet to come. 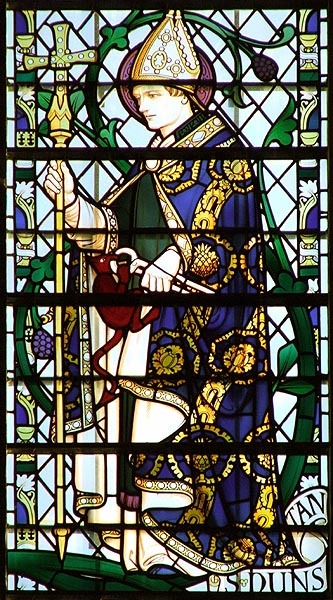 By his music, St. Dunstan would “rouse them to the thought of heavenly harmony.” Ah, the thought of heaven and its eternal harmony, where God’s will is ever done, and, for that very reason, every saint and angel is profoundly happy, resting in His ineffable sweetness, beauty, and glory! That goal should be the Christian’s mainstay in this valley of tears. We are being told that Dunstan’s music actually contained something of that goal in its “sweet words” and the “concord” of the airs or melodies. It is as if a little of heaven were present in his music, the way a person is already present when you hear his voice from a distance, even if he himself is not yet arrived. We see here a lofty saintly standard for all of our music. We learn about the true vocation of the musician, which is to elevate our sore, wounded, earthbound minds to sempiternal vistas of light, and even to set what is dark and difficult in the radiance of the light. Music, for a Christian, should serve the same purpose as everything else in life: weaning us from excessive attachment to this world and lifting our souls heavenward. If Newman is right, the message poses a challenge for each of us. Is the music we create, listen to, and take delight in, whether it be sacred or secular, music that will fit us to be better Christians and more noble human beings? Is this even a question we are asking ourselves on a regular basis? Please visit THIS PAGE to learn more about Dr. Kwasniewski’s Sacred Choral Works and the audio CDs that contain recordings of the pieces.